Hello everyone! 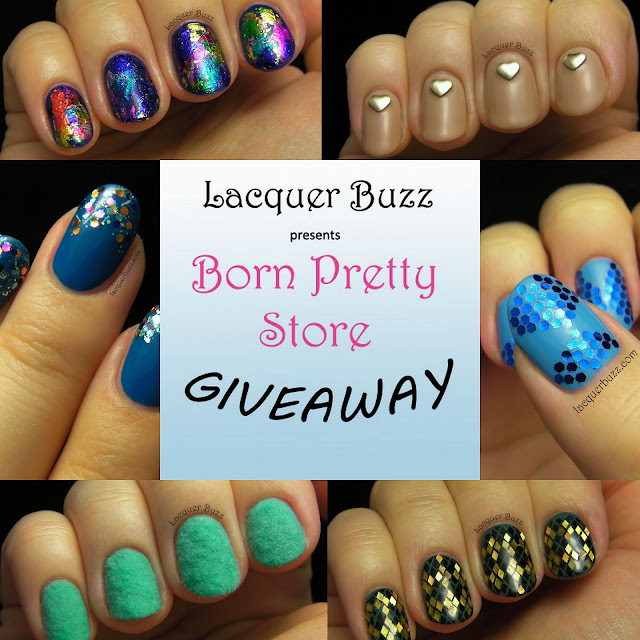 The winner for the Born Pretty Store giveaway was chosen and is displayed below. I have already contacted her and hope she replies soon. She has 48 hours to reply before I choose another winner. Congratulations! Hello my lovelies! Another month has passed and I really can't believe it. I was really not looking forward to June because it's the last month before graduation and it's gonna be crazy! 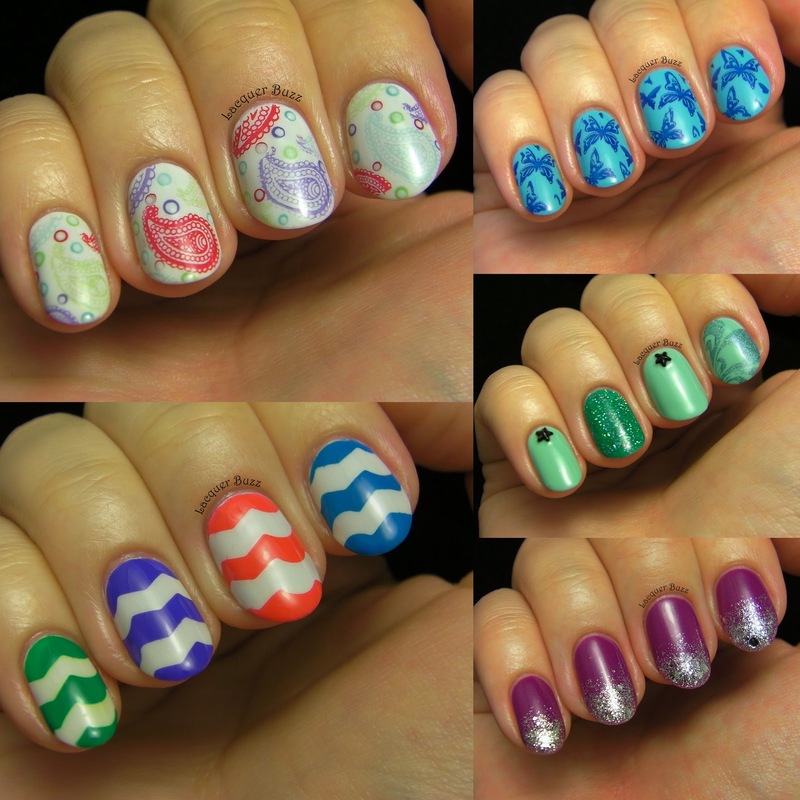 I've posted a lot in May, mainly because I was on holiday and we had the Romanian Easter, so it was very hard to pick just a few favorite manicures from this month. I ended up choosing the ones below. Hello my lovelies! 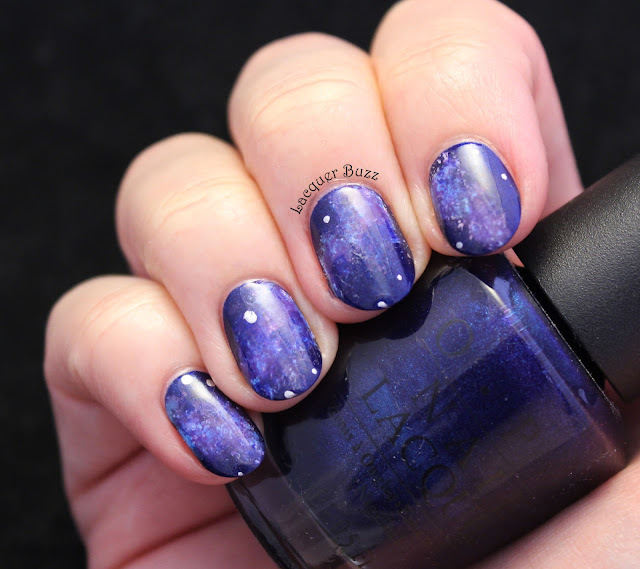 It's time for another post from the untried polish challenge I started last week. Today we had to use two untried polishes for our manicure and I decided to go pink, because it's also Wednesday. Hello my lovelies! It's Monday again but no worries cause there's an awesome blue coming your way today. Zoya nail polishes are hard to get around here and there aren't many online retailers who sell them. That's why I didn't have any in my collection. I finally got some with the help of the amazing Chiro and the first one I had to try out was a Pixie Dust. 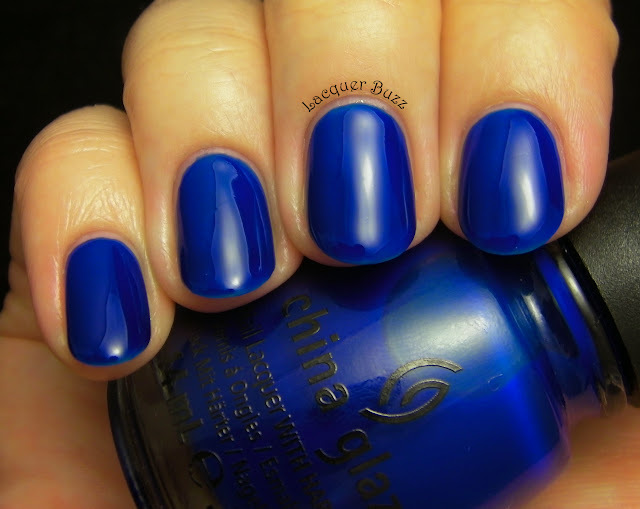 Naturally, I chose the bluest from the collection. Hello my lovelies and happy Sunday! I hope you are getting good weather where you are. It's been raining daily over here and it doesn't really feel like spring. 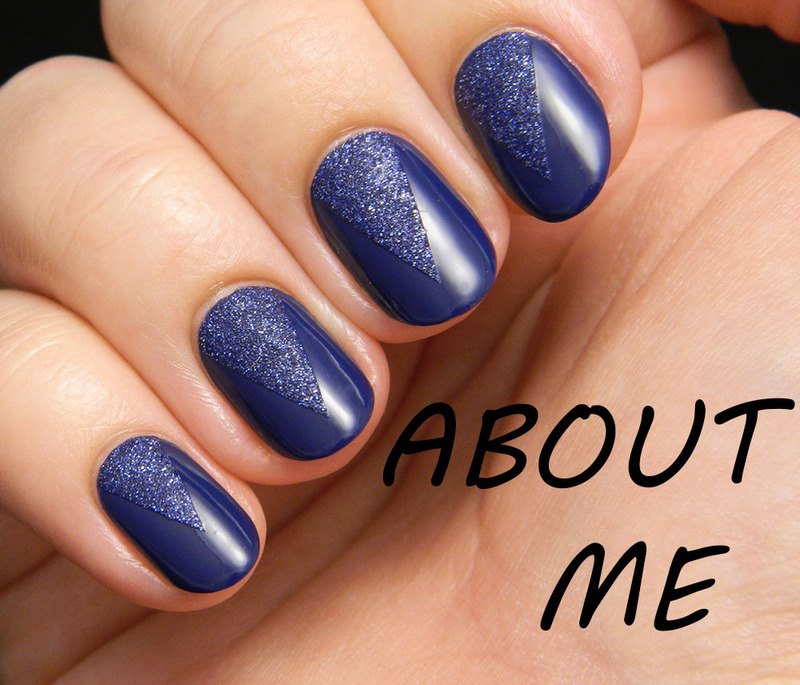 The manicure I'm showing you today is the one I wore last weekend. We had some sun so I decided to mix a minty spring color with some holographic accents. Here's the result. Hello lovelies! It's been over a month since the last time I did a manicure from this challenge. I've been a really bad blogger, I admit. I neglected this challenge because of Easter and everything, but now I'm back and I really hope I can finish it soon. The country we are traveling to today is Singapore. There are a lot of lovely nail bloggers in Singapore and I know some of them from Twitter and Instagram. I remember a conversation I had with Radha (@thepolishowl on Twitter) about the humid climate they have over there. Singapore is also a group of islands and it's surrounded by water, so that's how I got the inspiration for this manicure. Hello my lovelies! First, let me just utter a sigh of relief because it's finally Friday. This week has been very busy and stressful for me. Hopefully the next one won't be as awful. I wanted to write this post last night but I realized that even though I edited my pictures, I forgot to watermark them. So I just went to bed instead. I really wanted to get a post up today though, so here I am. The polish I'm showing you today could be labeled as boring by many people. I, however, am a big fan of grey polish and this one is just perfect. Hello my lovelies! I hope this week is being kinder to you than it is to me. I won't bore you with my whining but instead will show you an amazing polish. I'm participating in a new challenge today with my fellow Romanian bloggers. 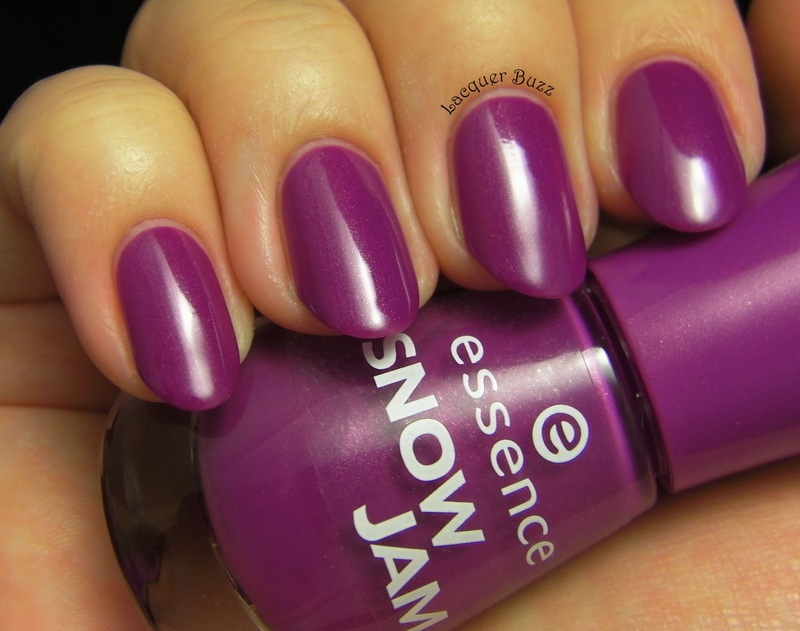 It originated as an untried challenge, but we decided to loosen the rules, so everyone can post what polishes they want, untried or older. I however have a lot of untrieds, so of course I will try to use some of them. Today's theme was really easy because we only have to use one color. Technically, mine is not a color because it's black, but there's also some silver glitter in there, so I hope it counts. Hello my lovelies! I swear I have no idea where this weekend went. It's Monday again so it's time for some blue. This time I'm showing you a gorgeous blue jelly. This post is quite pic heavy so let's just start with the jelly by itself. Hello my lovelies! Oh Saturday, how long have I waited for you! It's been a crazy busy week and I'm really sorry I haven't had much time for blogging and doing my nails. On Thursday I went to the local premiere of The Great Gatsby and it was amazing. Seriously, whether you are a Leo fan like me or not, you need to see this movie. It's spectacular! I really wanted to do some themed nails for the premiere but ran out of time and energy so I did something really simple and elegant. Hello my lovelies! It's Monday and when you'll be reading this I will probably be in class. It's been a great 2-week long holiday and I've blogged a lot in this time. It's been fun because I had lots of time for nail art. Unfortunately things will change because I'm graduating in 2 months and I will be extremely busy, which will result in less activity on the blog. I hope you'll forgive me and keep following even though there will be less posts. 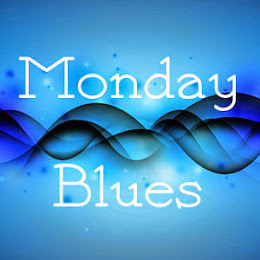 Of course I will never miss Monday Blues, that's for sure. Today I wanna show you two beautiful blues, in the form of a springy manicure. Hello my lovelies and happy Sunday! I hope you are all enjoying the lovely weather today. I plan to do so because it's my last day of holiday. I'm already dreading tomorrow. But back to happy thoughts, I have some older pictures to show you today. I wore this manicure before Easter and before I shortened my nails, so you will see that my nails look very long in these pictures. This was the point where I couldn't take it anymore and had to take them down. I started with a base of Essence Lilac Is My Style. Hello my lovelies! How are you all doing on this fine Saturday? I'm starting to feel sad because I have to go to school on Monday. This long holiday was a blast. 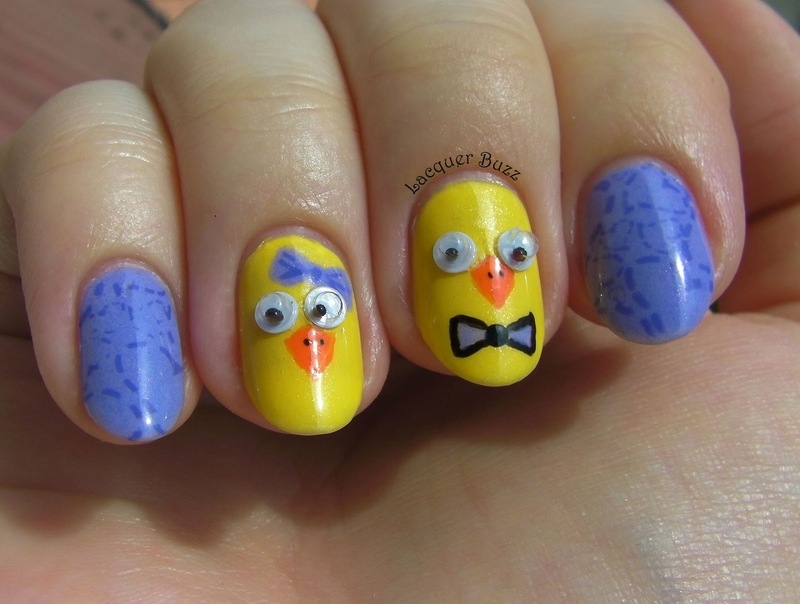 I have a fun nail art item to show you today. The Born Pretty Store has recently started selling these nail transfer foils that I've been wanting to try for a long time. Here's how they look. The foil comes rolled up in a little jar and has a length of 113 cm and a width of 2.5 cm. That's definitely a good quantity, so this will last for a large number of manicures. 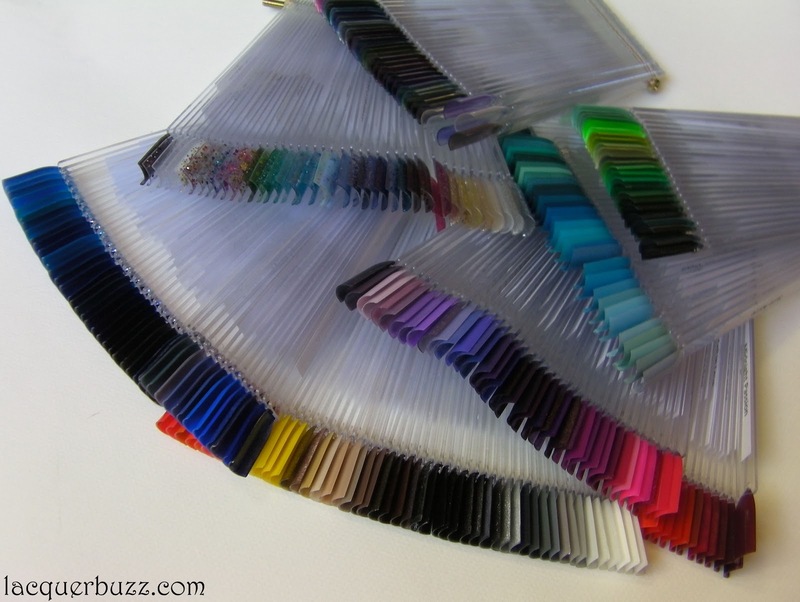 The foils can be found here and there are 27 colors to choose from. I chose the rainbow one (number 13) that has a few different colors on it, to create an interesting manicure with just one foil. Hello my lovelies! How is your week going so far? I'm still enjoying my vacation and my only regret is that the days are rushing by too fast. 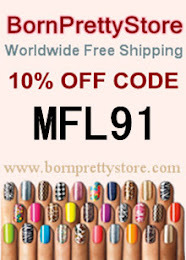 The Born Pretty Store has been so kind to send me some fun nail art supplies to review and I'm gonna show them to you this week. I'm gonna start with some glitter, because everybody needs some in their life. This is a glitter nail polish* that comes in a beautiful bottle, shown below. The brand of the nail polish is Tribal Colour and it has the number 24 on the bottom label. You can find it here on their website, where it's shade #4. It comes in a decent sized bottle of 12 ml (0.5 fl.oz.) and the price is very convenient. Hello my lovelies! It's Polish Days time again and the theme for this month is The Number 5. I will tell you from the start that this number has no meaning for me. There's no 5 in my birth date or in my house number, the only connection I can find with it is the fact that I'm currently 25 years old. But that doesn't mean much cause it will change again in December. So I didn't know what to do for this month's theme, but I really wanted to participate as usual. 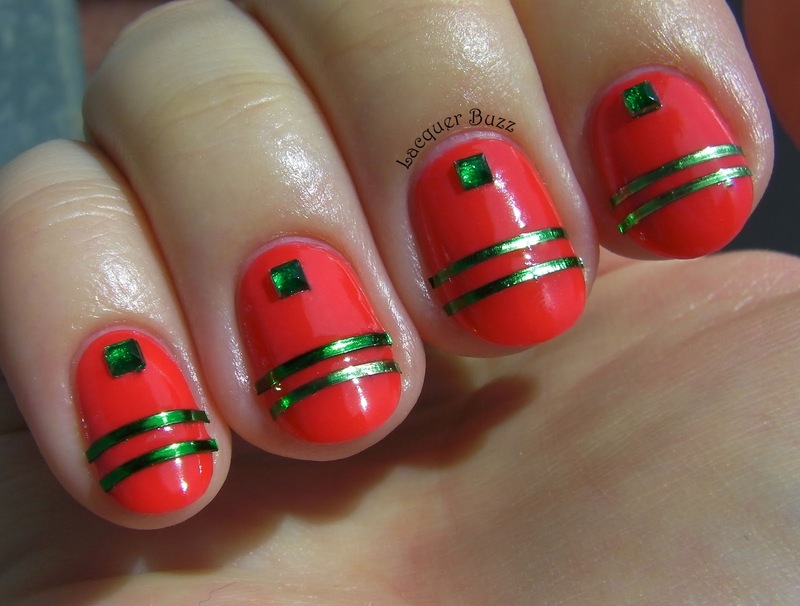 At the risk of doing something totally unoriginal, I chose Cinco de Mayo as an inspiration for my manicure. It's a little more than I would normally wear on my nails, but this holiday is all about color so everything is accepted. Hello my lovelies! It's a special Monday today because it's my 1-year anniversary for Monday Blues. It was exactly one year ago that I posted my first post in this series. Well, technically tomorrow would be one year but it's Tuesday. I haven't missed one week of Monday Blues ever since I started. No matter how busy I was, even on the weeks I didn't post anything else, Monday Blues was always present. I'm kind of proud of myself for not missing any weeks, so to celebrate I made a movie with all the blue manicures I posted during this year. Enjoy! And now let's get to today's blue. You all know how much I love China Glaze cremes, so I got this one because of my huge obsession with teal. Of course I also purchased other teals since I got this one, but I still find this one perfect. Hello my lovelies and happy Sunday! To those of you celebrating Easter today, I want to wish a very happy Easter! 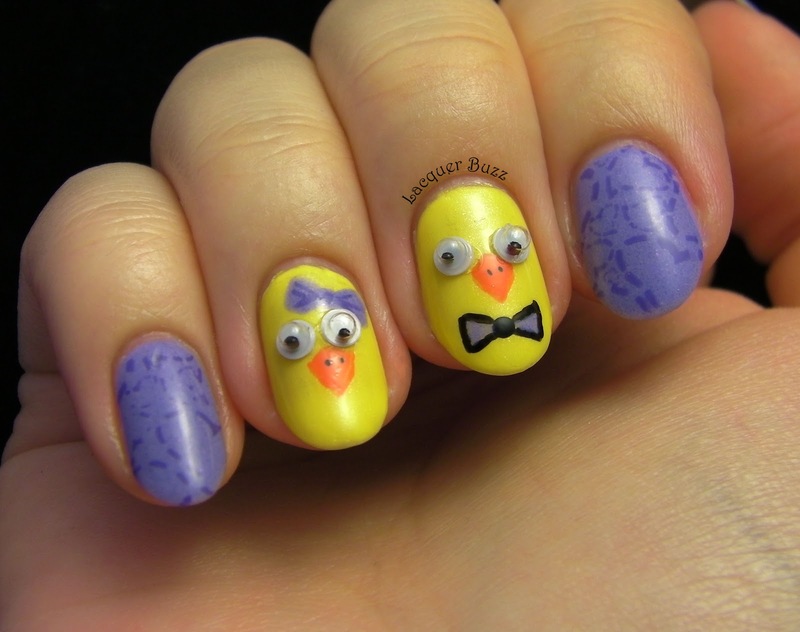 I hope you're not too tired of pastels and bunnies because today I want to show you my Easter manicure. First off, I filed down my nails yesterday because they were getting too long to bear. I feel so much better now! So over the next few posts you will see different lengths alternating because I still have a few manicures from last week to show you. After shortening my nails I wanted to make them as bright as possible and I also wanted to play with all the stuff I got in the last days. Here's the result. Last year I wore yellow for Easter (post here) and I wanted to do it again this year because I think it's the perfect color for this holiday. The fact that my boyfriend came back from Germany and brought me a bunch of amazing Kiko polishes was also helpful, cause one of the colors I chose was this bright yellow creme. I'm always looking for good yellows because everybody knows how hard it is to find one with a decent application. Kiko 355, also called Canary Yellow, is a pretty good one. It is still a bit streaky upon application, but the opacity is great, so what you see above are just 2 coats without any top coat. 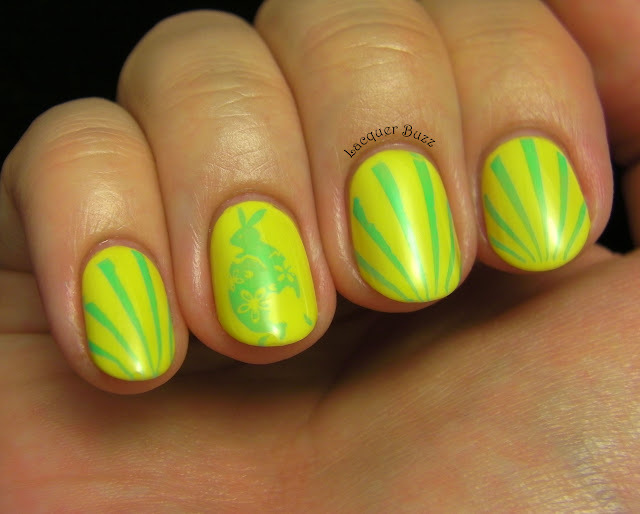 I finally got the 2012 Bundle Monster stamping set as a little Easter present to myself, so I wanted to play with it, of course. This set has a few holiday images, from which I chose the Easter egg with the bunny from plate BM-302 as an accent nail. 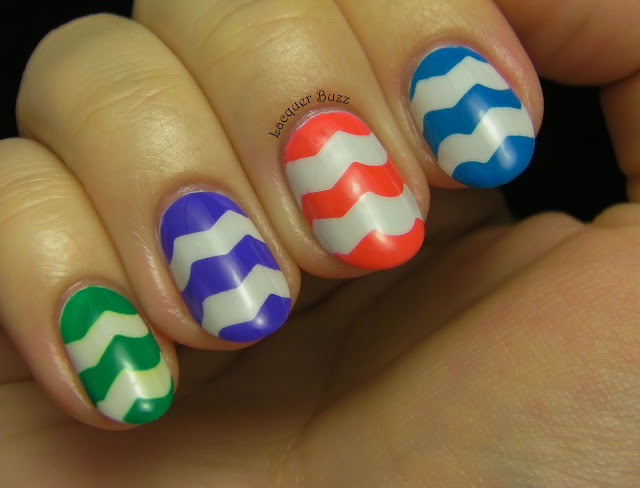 On the other nails I used an image from plate BM-301. 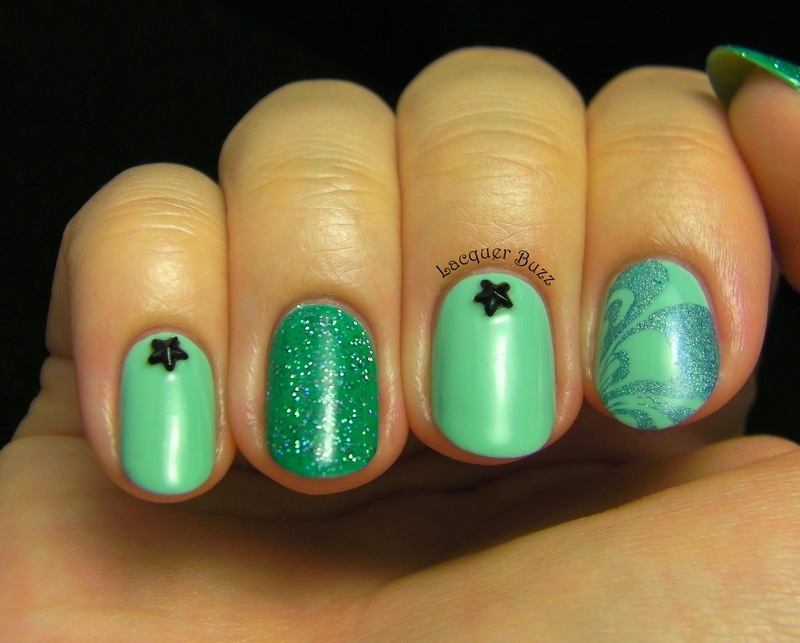 The polish I stamped with is a turquoise creme from Kiko, number 389 Mint Milk. I really like the combo of yellow and turquoise. I have to say that this Bundle Monster set has some of the most awesome designs I have ever seen. It's been on my wishlist since forever and I'm so glad I finally decided to order it. The quality of the plates seems great from what I've seen so far. 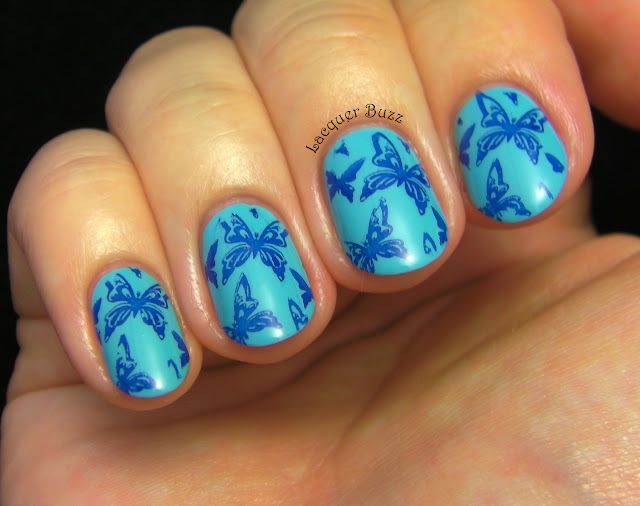 You can expect a lot of stamping manicures in the following weeks because I'm hooked! Hello my lovelies! Today's post is something a bit different, but I hope at least some of you will enjoy this type of post. I'm gonna talk about how I organize my nail polishes. Well, not how I organize the bottles themselves, I have a whole video showing you my pretty red Helmer (link here), but my way of keeping my whole color palette together so I can pick and compare my polishes. A few other bloggers have done posts about these and they have called them swatch sticks. Hello my lovelies! Man, I can't believe it's already Friday. This week has been a lot of fun, especially cause this Easter challenge has kept me busy. Time flies when you're having fun! 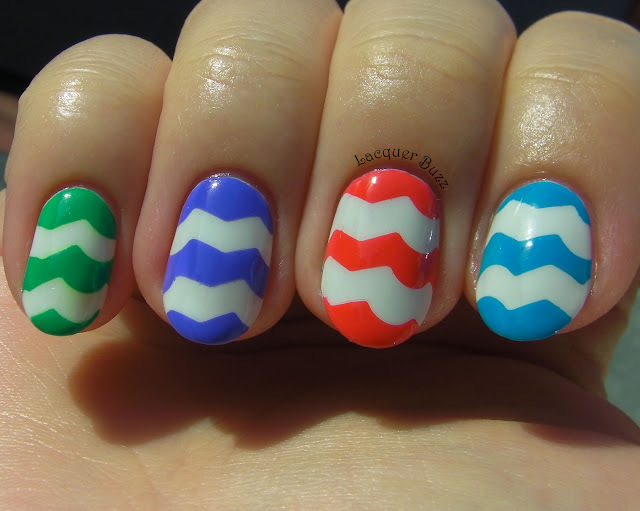 So here we are with the last manicure of the challenge. Today's theme was "pastels", which I considered a lot easier compared to the other ones. This manicure is from last week so my nails are a little shorter. Now that the challenge is over, I can't wait to chop them off cause they are honestly getting too long. Anyway, on to the design. Hello loves! 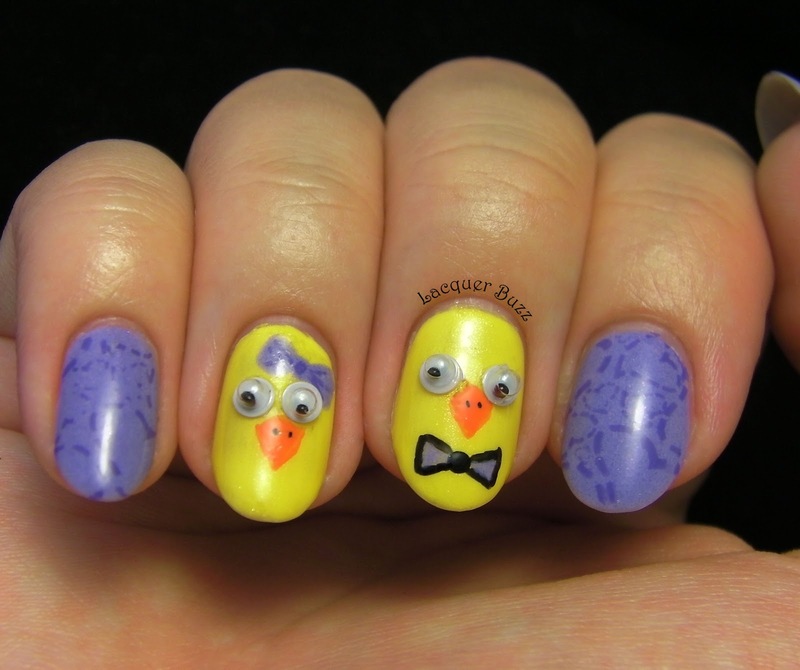 Another beautiful spring day today and I have a manicure from the Easter challenge to show you. For today's theme we had to paint chicks on our nails. I'm talking about the yellow and fuzzy kind. Again I had a little trouble figuring out what I was going to do. Here's what I came up with in the end. I saw these googly eyes in a craft store a few weeks ago and thought they would be perfect for this manicure. Unfortunately it was impossible for me to secure them properly on the nail. I really need to invest in some nail glue. I tried to secure them with top coat like I do with studs and rhinestones, but they are too big and get caught on stuff, which makes them come off at some point. 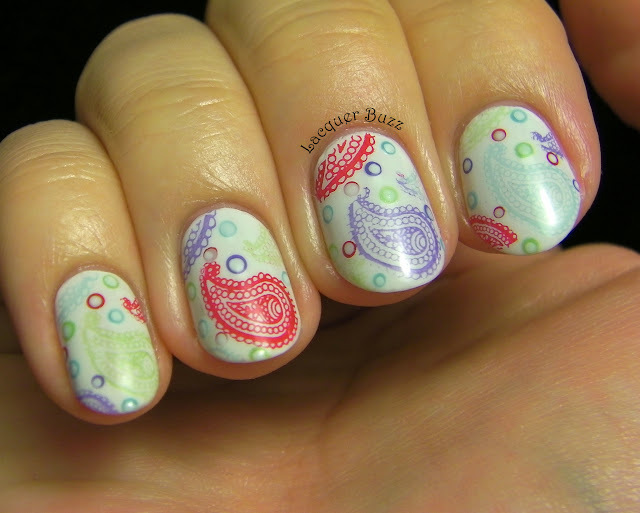 For the non-chick nails I used Essence A Lovely Secret as a base and then stamped the image from plate CH15 using S-he Stylezone 247. 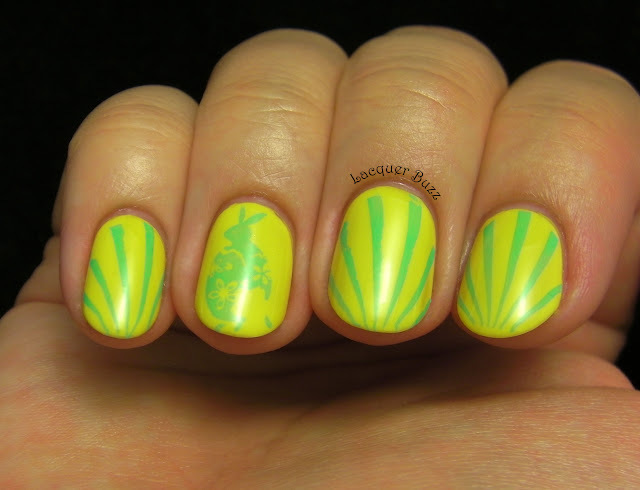 This image looks quite nice on the plate but it looks kinda random on the nail. Those are hearts, in case you can't figure it out from the picture. 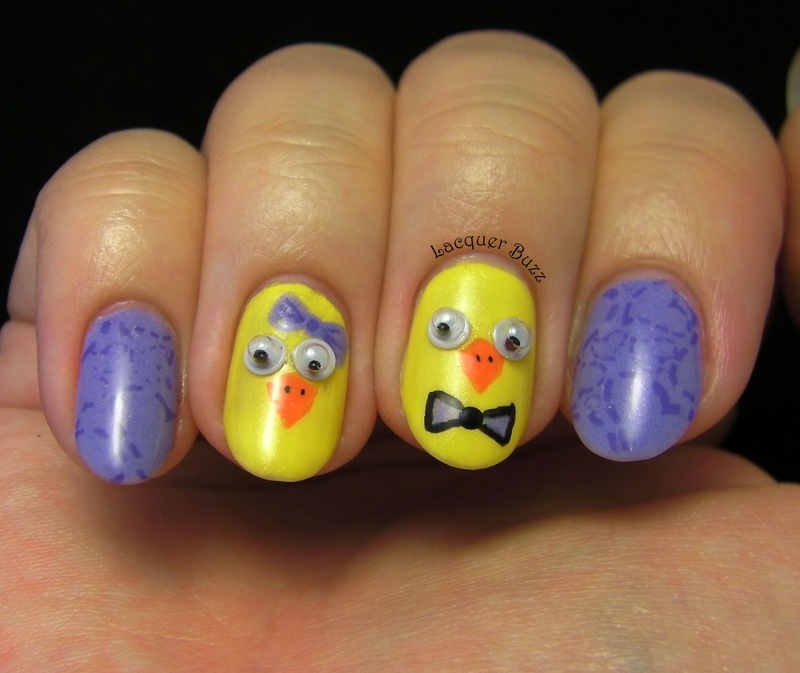 For the chick nails I used Rimmel Sunny Days as a base, with Rimmel Tangerine Queen for the beak and the same purples from the other nails for the bows. Hello my lovelies! It's the first of May and for us it's a public holiday (labor day) and people are having picnics and barbeques, or they even go to the seaside. I know some other countries have today off too, so if you live in one of them, enjoy this beautiful day! 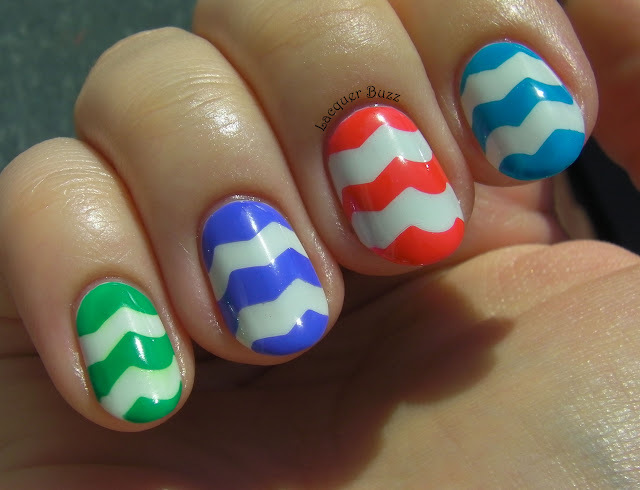 And if you have to go to work, I have some colorful nails to cheer you up. 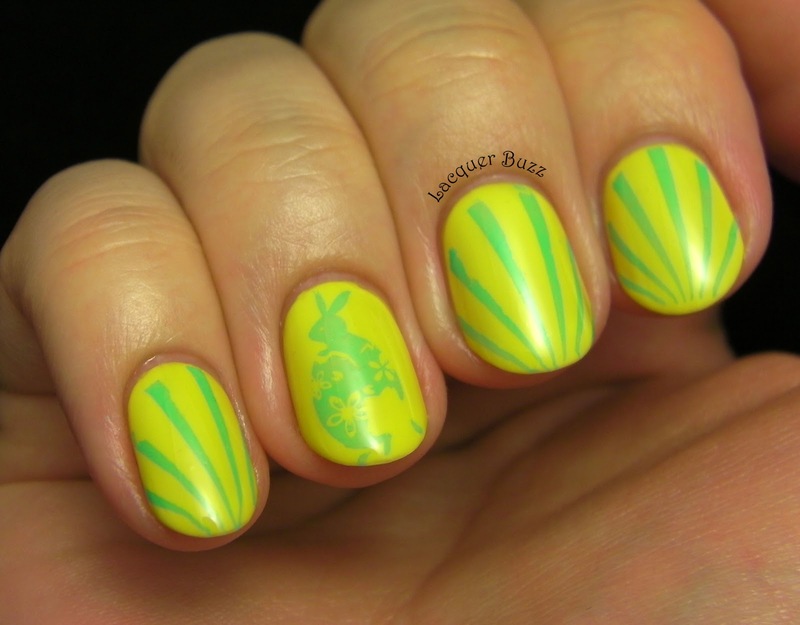 I'm continuing the Easter challenge today and the theme is Easter eggs. I've been wanting to experiment with crafting scissors and tape for a long time, so this was the perfect occasion. Here's what I came up with. Last week I went to the store and got 2 pairs of crafting scissors with funky designs on them. I wanted to get some with a chevron pattern but they didn't have them, so instead I got these that have spikes alternating with waves. The other pair I got was also used, but you'll be seeing that design some other time. I won't deny that you need lots of patience with this kind of design, especially with cutting the tiny tape pieces with the not so tiny scissors. But I think the clean lines are totally worth it! I started with 2 coats of OPI My Boyfriend Scales Walls and a coat of Seche Vite. 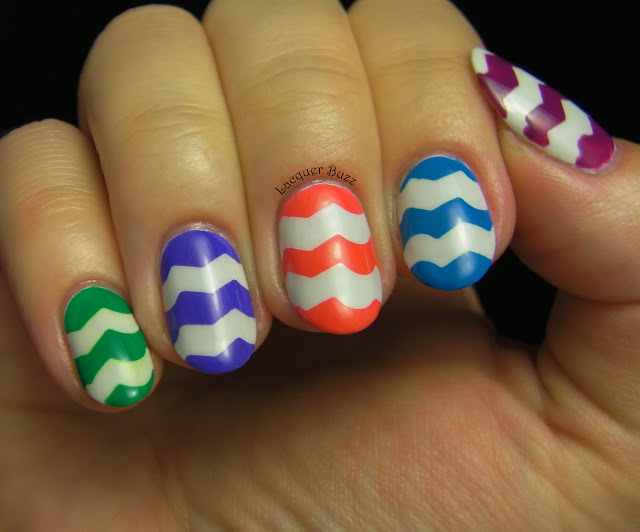 Then I let the nails dry for about 15 minutes before taping them with the pieces of tape that I cut beforehand. I used 5 of my most bright polishes to paint over the nails. The green is China Glaze Four Leaf Clover (it bled a little into the white, not sure why), the purple is Color Club Pucci-licious, the coral is Eyeko Coral, the blue is Barry M Cyan Blue and the purple on the thumb is Barry M Bright Purple. I removed the tape while the colors were still wet and waited for them to dry, then finished with a coat of Seche Vite. If you want a tutorial for this, please tell me in the comments.